The early nineties were a tumultuous time for the Eurasian country of Georgia, and it serves as the ever-present and oppressive force driving the coming-of-age tale, In Bloom (not to be confused with another 2013 drama of the same name). The film is a very stark and real document of life for teenage girls in civil war-torn Georgia. 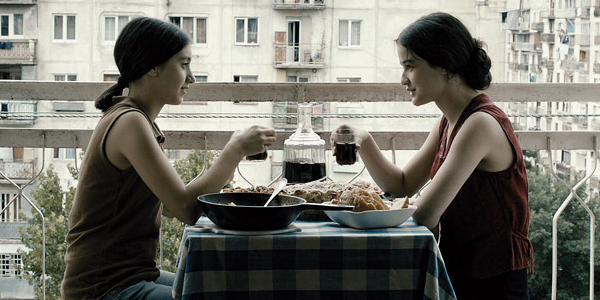 Bombings, unbearable familial tension, poverty, and forced marriages are just a few of the storm clouds hanging over Natia (Mariam Bokeria) and Eka (Lika Babluani). Things are bleak and grow bleaker still when Natia and Eka get their hands on a gun, and, suddenly, every mounting pressure in their adolescent lives takes on a whole new air of awful. The suspense of wondering what, if anything, will push them to actually use the gun adds a needed layer of tension to what started as a rather monotonous but admirably accurate drama. The trying tale unfolds for the girls in very true-to-life cinematography. The camerawork is often handheld and feels claustrophobic. You’ll leave almost knowing what it’s like to squeeze through a cramped and hostile breadline. There’s not much in the way of sweeping cinematic grandeur, but the tense atmosphere nonetheless translates perfectly. And, In a bold choice, there’s not much in the way of a musical score. I wish I could say all these things are complete positives, but they do make for an occasionally somniferous and often dreary affair. Child actors are notoriously hit-and-miss (mostly miss), but In Bloom’s two teenage leads give startlingly genuine performances. Not one line feels forced or off-key. Shocking still–this is the first cinematic outing for each. One would reasonably expect them to start appearing in more film or TV. I sincerely hope they’re not one-and-done’s. Directors Nana Ekvtimishvili (for whom some of this is autobiographical) and Simon Gross introduce a world that will make you appreciate what you were doing in the nineties–playing with snap bracelets. But you probably weren’t getting bride-napped (a practice wherein a girl as young as 14–or younger–is kidnapped and married, most likely to her abductor). It was so common that, when it happens in the film, the victim seems almost accepting, as if it’s as common as going on a date. In Bloom is a good film, no question. If the subject matter is of particular interest to you, it might even be a masterpiece. It’s won numerous awards across the globe and was even Georgia’s frontrunner at the American Academy Awards in the foreign language category. Additionally, a coveted 100% rating on Rotten Tomatoes is almost within its reach. However, I will warn you, this unapologetically no-nonsense depiction of war-torn Georgia isn’t going to leave you with the warm-and-fuzzies. If that’s what you’re after, you might do well to steer clear of this one.